Håkon Thelin finished his master study at the Norwegian State Academy of Music in 2003 where he did a theoretical and practical study on percussion techniques on the double bass in modern music. He is one of the premier double bass interpreters of contemporary music in Scandinavia and has composed several works for the instrument. He works freelance in all Norwegian symphony orchestras as well as chamber-groups like Cikada, Apartment House and musikFabrik Köln. From 2005 he has had regular engagements as principal double bass in the Norwegian Opera. Håkon is a member of the contemporary music ensembles Oslo Sinfonietta and POING. POING has premiered more than 60 works and have been working with composers like Richard Barrett, Dror Feiler, Luca Fransesconi, Helmut Oehring, Rolf Wallin and Michael Finnissy. Håkon plays regularly recitals with contemporary music and his first solo recording “a p)reference to other things” was released in 2004 on Albedo with works by Iannis Xenakis, Bent Sørensen, Jacob Druckman as well as his own works. Håkon is teaching a new subject called "Improvisationbased contemporary music" at the Norwegian State Academy of Music. From 2007-2010 he is employed by the same institution on an PhD-level artistic research program with a project called "A new world of sounds - advancements in contemporary double bass techniques". The objective of the project is twofold: first to investigate novel playing techniques for the double bass with basis in works by Stefano Scodanibbio and Philippe Boivin. Second to develop entirely new techniques for the double bass and compose new works for the instrument. Born in Ravenna, he started his Double bass musical studies under the guidance of Leonello Godoli at the Liceo Musicale of Forlì. While still a student he won 1st price in the National Competition “Città di Sesto San Giovanni and was enrolled in the register of the Royal Filarmonica Academy of Bologna. After obtaining full marks in his diploma at the “G.Rossini” Conservatoire at Pesaro, he was chosen to participate in the European Community Youth Orchestra. There he met Franco Petracchi, with whom he then studied for five years at the post diploma course of the “Walter Stauffer” Institute at Cremona and subsequently at the Accademia Chigiana of Siena where he won the Honours Diploma and the “G. Bottesini” Scholarship for the best pupil. Having previously won the International Competition at Stresa and 2nd price at the “Bottesini” Competition at Parmain 1991, he was the winner of the prestigious ARD Competition of Munich (2nd prize, no 1st prize awarded) and since then has had an intense career not only as a soloist, but also playing chamber music and teaching. He has played the Koussevitzky Concerto and Mortari’s “Rapsodia Elegiaca” with the Bayerischen Rundfunk Orchestra, Bottesini’s 2nd Double bass concerto with the Northwest Deutsche Philarmonia and Bottesini’s “Gran duo concertante” and “ Passioni amorose” with the Toulouse String Orchestra. With the pianist Stefano Madona he has played at numerous festivals including Musica Riva (Riva del Garda), Ticino Musica and Schaffausen (Switzerland). With regard to chamber music he has performed at “La Scala” theatre, among other pieces, Prokofiev’s quintet, Bottesini’s “I Puritani” and Rossini’s duet, both for Cello and Double bass, Bottesini’s Gran duo for Clarinet and Double bass and the “Bolero”. At the “Alighieri” theatre of Ravenna he performed Schubert’s “Trout” quintet with La Scala String Trio and Riccardo Muti at the piano. Founder member of the “Solisti della Scala” and the “Ensemble Strumentale Scaligero”, he has made several CDs with both groups; the recordings include Bottesini’s “Grand duo concertante” for violin and Double bass, “Gran duo” for Clarinet and Double bass and “Fantasia on the theme of the Sonnambula”. He has performed as a soloist with these groups in the principal Italian and European Festivals. He has also collaborated with the Berliner Philarmoniker Sextet and with the Borodin Quartet performing Glinka’s sextet. His repertoire ranges from the Baroque period to contemporary works with particular attention to the work of Bottesini, his interpretation being always as faithful as possible to the original part. His continual search to find new sonorities on his instrument have brought him, among other things, to widen his knowledge of the baroque repertoire. As a result he performed in Milan, Venice and Forlì Telemann’s Fantasy in D major for Viola da gamba, G.Sammartini’s Sonata in A minor for Violoncello and J.S.Bach’s Sonatas BWV 1027 & 1028 for Viola da Gamba, all played on the Double bass with a baroque bow, accompanied by Emilia Fadini on the Harpsichord. For the new label “NBB Records” he has taped two CDs including works of Sammartini, Telemann, Bottesini, Misek, Berio, Henze, Piazzolla and various of his own composition, which show his interest in modern musical forms from Jazz to New Age. There have been numerous radio and television transmissions in Italy, among which Bottesini’s “Bolero” (for Radio3), and in Switzerland, Germany, France, Slovakia and Sweden. Since 1991 he has been 1st Double bass of both the Opera Orchestra and Filarmonica della Scala; with the latter in the concert season 2005/2006 he performed as soloist the Aria “Per questa bella mano” by W.A.Mozart conducted by Kazushi Ono. He teaches in Milan both at the Accademia della Scala and at the Scuola Musicale; he also held masterclasses at Capbreton (France), Segovia (Spain), Ticino Musica (Switzerland), Stockholm (Sweden), Portogruaro and Ferrara (G.Mahler International Academy), in the main Italian conservatoires, at the Guildhall School of Music at London and at the Conservatoire of Paris, Lyon and Pau; also in programme for 2009 is a masterclass at the “Musikene” of San Sebastian (Spain). He is regularly invited as a member of the juries of national and international competitions, among others the last editions of the International Competition of Geneve, the Bottesini Competition of Crema and the Stringed Instruments Triennale of Cremona. He plays on a Custode Marcucci double bass dated 1890. 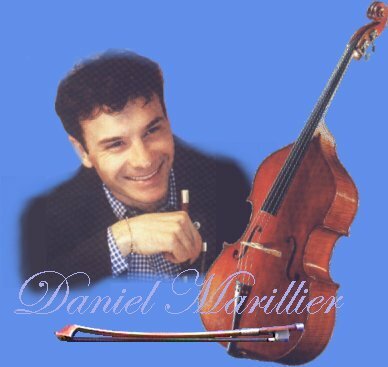 Daniel Marillier began playing the double bass at the age of 7 in a class taught by his father in Nice. At 14 he went on to attend the C.N.S.M. in Paris (National conservatory of Music) where he was taught by Jean-Marc ROLLEZ. During that time he won various prizes including the Special Jury Prize at the International Competition held in the Isle of Man at the age of 16. He then went on to become the principal double bass in the orchestras of Nice and then Strasbourg and in 1984 became the first principal double bass of the Opera de Paris-Bastille Orchestra at the age of 22.